We’ve made it through the first three months. I don’t know why this comforts me, but it does. I have yet to have any real pregnancy cravings, more food aversions, so this week when J and I were driving home Saturday night I was shocked when I insisted we pull over at the grocery store for some ham. This is coming from a girl who can’t remember the last time she ate ham. I wanted a hot ham and cheese sandwich on a small roll. Mmmm… my mouth is watering as I type this. I didn’t want deli ham I wanted the real stuff, so this is what I ended up with this week. We had thick munster cheese at home and I picked up small rolls to complete the package. There has nothing that has been more satisfying in the past three months. This weeks appointment was a highlight of my pregnancy so far. I still don’t have symptoms, or feel very pregnant at all, so seeing Baby E doing somersaults in my belly was incredible. It blows my mind that something can be moving that much inside of me and I have no feeling whatsoever. 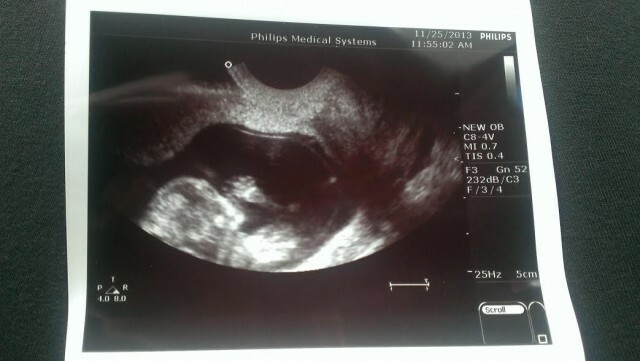 His/Her heartbeat was 152, up from 134 at 7 weeks, so he was much more active this time and his heart was beating faster! I loved the detail you could see in the ultrasound, we watched as he waved his fingers, saw his spinal cord and brain as they have started to form. It is truly a miracle how babies are born and develop. P.S. I’ve always thought it was weird when people show off their ultrasounds, mainly because they are showing you a picture of the inside of their uterus… but if you can’t beat them .. join them. Here is my uterus 🙂 and Baby E waving to say hello! Epiphany of the week: I made it three months! I can’t believe it’s been 3 months, with 6 left to go. I am super impatient and every day of the last three months has seemed like a year long, but looking back overall the time flew by. With the holidays coming up quickly I can already tell the next few months will move quickly – soon it will be January and we will be sitting on a beach in ^&%$#@S! Obsessions/Cravings? 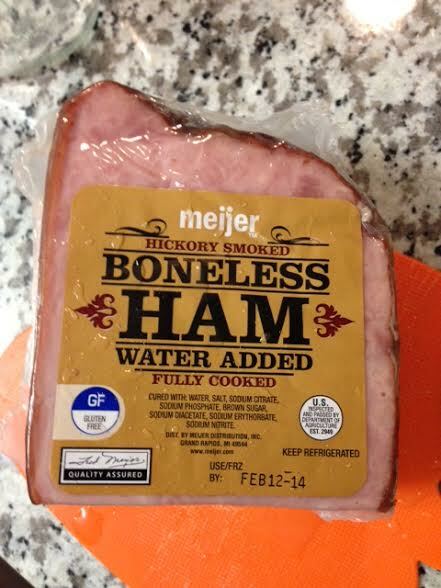 I had my first real craving this week… ham. I rarely eat meat and if I do it is never ham. But baby wanted ham this week so baby got ham! What I’m most looking forward to this week: Thanksgiving! And not for the reason you think. I’m not a big thanksgiving food person, I actually could do without the Turkey, Stuffing and Mashed taters, but this Thanksgiving not only do we have heaps to be thankful for, but we get to tell Papa Earl, Joshs Grandfather, about our Pregnancy. I can’t wait to see his face and hear his reaction! What I miss the most: On the weeks when I get to see/hear my baby, I don’t miss anything. It just reminds me that all the food/drinks I’m giving up, and the changes in your body are all worth it. Women’s bodies are incredible in that they can grow a baby and then feed it to nourish it. Pretty Pretty Cool! Symptoms: Still having headaches, but after talking with the doctor she mentioned one of two things 1. Progesterone – which I have always assumed was the culprit as my hormones change or 2. Caffeine Withdrawal – I did give up caffeine cold turkey so she suggest if i do get a headache adding in a small bit of caffeine to my diet that day and see if it helps.